The weather in Melbourne has been pretty miserable for the past few days, but the Sun was shining this morning when the Venus transit commenced at around 8.15am. A transit is an event whereby a planet passes between our line of sight and the planet’s host star — in our Solar System this means a planet passes between the Earth and the Sun. This can only happen with Mercury and Venus. 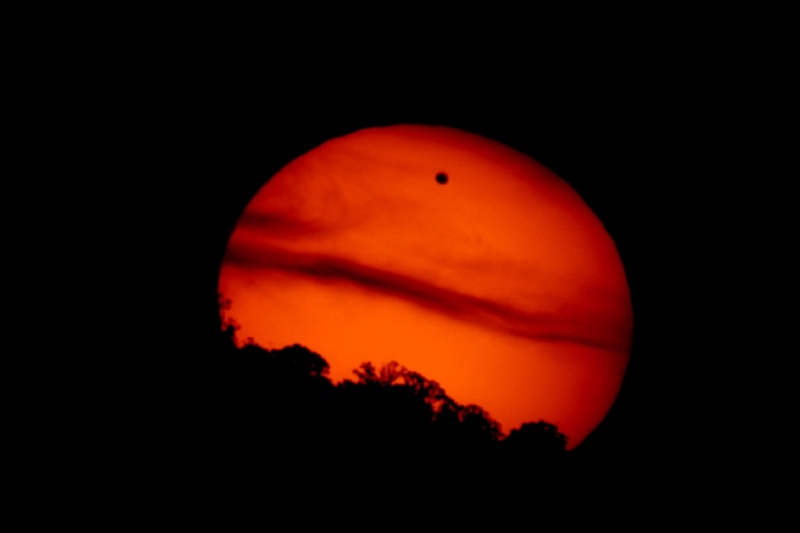 During the transit the planet appears as a small black dot passing across the face of the Sun. Because the orbital plane of Venus is tilted by 3.4 degrees from that of the Earth’s orbital plane, Venus transits are quite rare. They have a strange pattern, whereby a pair of transits 8 years apart is separated by 121.5 years and 105.5 years. So since they were first discovered there have been just 6 transits of Venus: 1639, 1761, 1769, 1874, 1882 and 2004 – and now 2012. And the next one in won’t be until 2117 – so today is your last chance! New results presented at last week’s 2012 Fermi/Swift GRB conference in Munich, Germany, has shed new light on the emission mechanism of gamma-ray bursts (GRBs). GRBs are brief but very intense bursts of gamma radiation. Gamma-ray telescopes like the Fermi and Swift space telescopes are detecting about one GRB per day coming from all directions in the sky, with each flash lasting from a few milliseconds to a few hundred seconds. There are two flavours of GRBs defined by the length of their burst: long bursts (longer than two seconds), which are associated with supernova explosions, and short bursts (shorter than two second) are thought to originate from the merger of two compact objects such as neutron stars. Both types are GRBs are likely signal the birth of a black hole. For the past 20 years it has been assumed that γ-rays emitted from GRBs result from synchrotron radiation, whereby electrons emit high-energy light as they are accelerated along magnetic field lines embedded in the shockwaves that rippling out from the explosion. 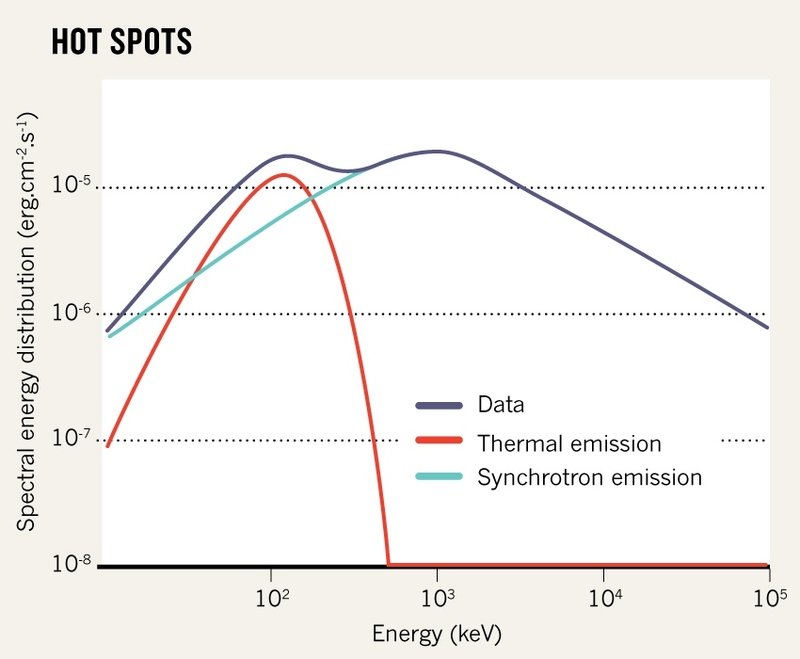 However, using the high resolution of Fermi it seems that the γ-rays are actually generated by thermal emission at the surface of the fireball. By analysing the spectral energy distribution of dozens of GBRs, Sylvain Guiriec of Goddard Spaceflight Center suggests that the small bump in the power-law rise of the energy distribution points to thermal emission. Discovered in 1802 by Heinrich Olbers, 4 Vesta – located in the asteroid belt- is a dry, differentiated object with signs of resurfacing and intense meteorite impact. Vesta is a unique object formed during the early stages of the solar system 4.56 billion years ago. It is also though to be the source of the howardite-eucrite-diogenites (HED) meteorites. As part of NASA Discovery Program, Dawn was launched in September 2007 with three scientific drivers: (1) to capture the earliest moments in the origin of the solar system enabling us to understand the conditions under which these objects formed; (20 to determine the nature of the building blocks from which the terrestrial planets formed; and (3) to contrast the formation and evolution of two small planets that followed very different evolutionary paths so that we understand what controls that evolution. The two small bodies chosen for this mission were 4 Vesta and Ceres 1, both of which are thought to be surviving protoplanets. The Mars Express mission, launched in 2003, aims to study of the atmosphere, surface, subsurface and interior of Mars. While the Beagle 2 lander, due to land of Mars on Christmas day 2003, failed to communicate and was declared lost in February 2004, the orbiter has been successfully doing science since 2004. A series of on-board instruments have been mapping the surface at high resolution (10m/pixel globally and 2m/pixel in targeted areas), producing surface mineral composition maps, probing the subsurface structure to depths of a few kilometres, determining the composition and circulation of the atmosphere, as well as studying the effect of the atmosphere on the surface and the interaction of the solar wind with the atmosphere. With more than five years of high resolution gravity data produced by radio tracking of Mars Express and the Mars Reconnaissance Orbiter, Mikael Beuthe from the Royal Observatory of Belgium and collaborators have gained unique insights into the structure and formation of the Mars’ largest volcanoes. 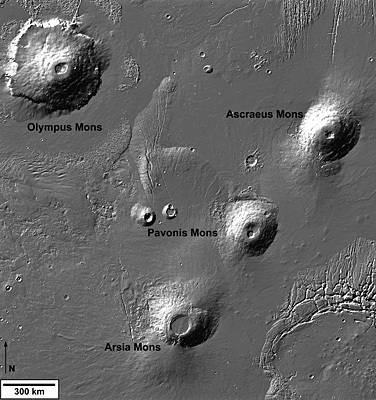 The enormous mass of the volcanic Tharsis bulge region on Mars, which hosts the Solar System’s largest volcano Olympus Mons which reaches a height of 21 km, perturbs the trajectory of Mars Express as it flies overhead. These wobbles produce a Doppler shift in the spacecraft’s radio signal which is measured from Earth and translated into measurements of density variations below the surface. A recent study of the motion of about 400 stars in the solar neighbourhood suggest that our region of the Milky Way is devoid of dark matter. As discussed in the 6 April post, while we cannot yet detect dark matter, we believe it must exist because of its gravitational effect. In the Milky Way (and most other spiral galaxies) the inner part of the Galaxy rotates like a solid body, which means that the velocity increases with distance from the galaxy centre, but in the outer parts of the galaxy the rotation curve is flat, so the velocity remains constant with increasing distance from the galaxy centre. This means that stars in the outer parts of spiral galaxies must be feeling the pull of more gravity that stars in the inner part of the galaxy. And yet from observations we know there are less stars and less gas in the outer parts of spiral galaxies – hence flat the rotation curve of the Milky Way and other spiral galaxies suggests the existence of a dark matter halo surrounding and permeating them. Using results of a kinematic study of 412 red giant stars in the thick disk of the Milky Way within 4.5 kpc from the galactic plane, Christian Moni Bidin of the Universidad de Concepción in Chile and collaborators have been able to calculate the total mass of material in a region of the solar neighbourhood four times larger in volume than previously considered. By studying the motion of the stars, especially those moving away from the galactic plane, the team can then calculate the mass within that volume since the motion of the stars are effected by the mutual gravitational interaction between all material present – stars, gas, dust and dark matter. To their surprise, the mass of the observable matter in the volume exactly matched the dynamical mass required, indicating that there is no dark matter in this volume of space. They go on to conclude that Earth-based experiments that are trying to detect dark matter particles will almost certainly fail. However, other astronomers are skeptical. As Moni Bidin et al. 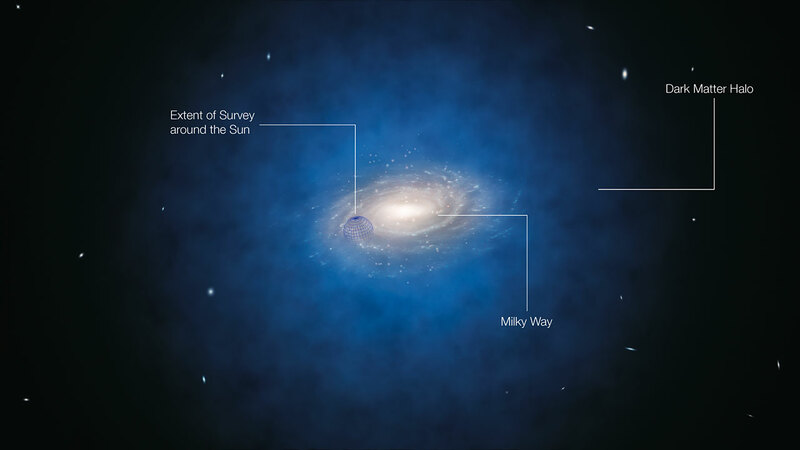 point out, the analysis assumes that the Milky Way’s dark matter halo is spherical. The results could be explained by a very elongated dark matter halo surrounding the Milky Way with little dark matter in the vicinity of the Sun. Furthermore, Moni Bidin et al. assume a constant average orbital speed of stars in the Milky Way (i.e. the average orbital speed does not depend on distance from the galactic center), which influences stellar motions in the vicinity of the Sun. As Avi Loeb of Harvard University points out this assumption of contact average stellar orbital speed actually requires dark matter, unless gravity is modified from the Newtonian inverse-square law. 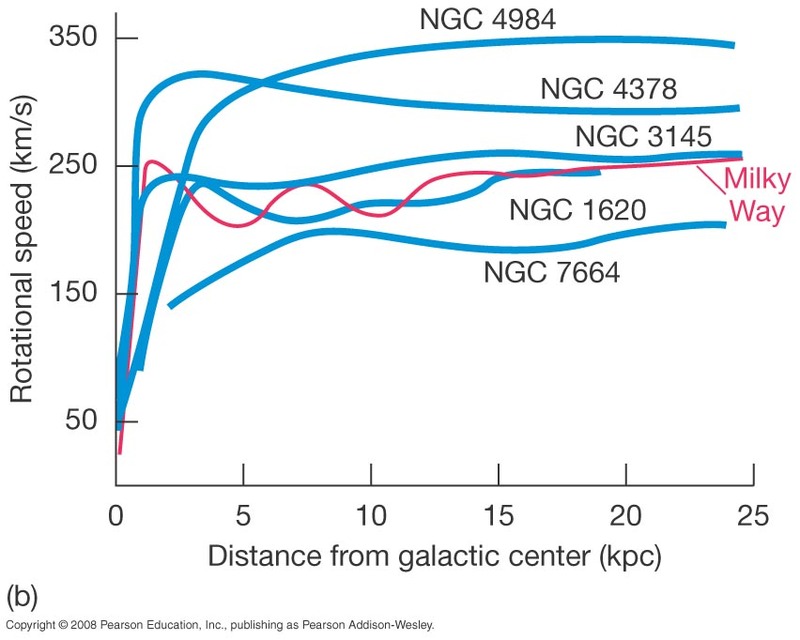 The theory of modified Newtonian dynamics (MOND) can be used to explain the rotation curves of spiral galaxies by having an extra gravitational “kick” at the edge of galaxies. However, MOND doesn’t work so well for elliptical galaxies, galaxy groups and clusters, and larger-scale structure. Perhaps less-massive warm dark matter particles (rather than more massive cold dark matter particles) could be help salvage the problem by having the dark matter distributed on wider scales in the inner parts of the Galaxy than on the outer parts. However, in terms of cosmology, the less massive warm dark particles form galaxies too quickly to explain observations of the early Universe. Cosmic dust comprises only a tiny fraction of the Universe’s matter but is has an important role to play in a wide range of astronomical studies. Dust can absorb, emit and scatter photons, drastically altering our view of the source we are trying to study. Rocky material is needed to form planets, dust is a key component in the chemical evolution of galaxies including our own Milky Way, and interstellar dust effects the light from distance galaxies which are used to study the early Universe. The cosmic dust cycle begins with the formation of grains that condense in the cool outer envelopes of evolved stars. The dust is then ejected into the interstellar medium by strong stellar winds. Once in the ISM, dust grains act as seeds upon which molecules can form, which go on to form molecular clouds out of which future generations of stars will form – thus continuing the dust cycle. While the details of dust-driven stellar outflows are understood in principle, the type of grains that drive the outflows are not well constrained. The general picture is that stellar pulsations lift the envelope gas to an altitude where it is cool enough for dust to condense and then the newly formed dust grains are accelerated away from the star by stellar radiation pressure. The accelerating dust collides with the gas, causing it to accelerate and thus driving an outflowing wind of gas and dust. Up until now, however, observations of this tenuous gas and dust just a few tens of milliarcseconds from the star have not been possible. PhD student Barnaby Norris of the University of Sydney and collaborators have used the ESO Very Large Telescope to observe three asymptotic giant branch (AGB) stars using aperture masked polarimetric interferometry. This technique allows them to study the dust shells around the AGB stars in scattered light at three near-IR wavelengths extremely slow to the stars – less than two stellar radii. With dust modelling the team have determined the size of the dust grains and also the amount of dust responsible for the scattered light. The grains are surprisingly large – about 300 nm in radius – and their spectral signatures indicate a composition dominated by magnetism-iron silicates, either olivines and/or pyroxenes. Further analysis demonstrates that the dust cannot comprise iron-rich silicates, as these would have formed further from the stars than two stellar radii. Instead the team suggest that the large grains must be made of iron-free silicates like forsterite and enstatite. These silicates are almost transparent to stellar photons at 1 micron, and so despite their close proximity to the intense radiation field they do not heat to sublimation temperatures and hence they survive. 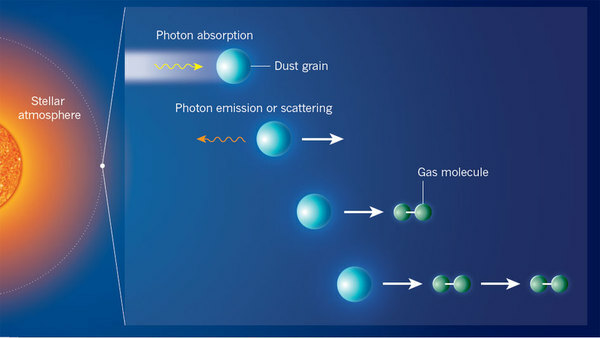 However, being transparent to near-IR photons also means that the grains will not be effected by radiation pressure required to drive the outflows. It turns out, however, that these large magnesium-rich silicate grains are effected by photon scattering which provides the radiative acceleration required to drives the winds. Currently everything we see in the Universe with our telescope – across all wavelengths – only constitutes 20% of the mass of the Universe, with the other 80% comprising what is known as “dark matter” (since we cannot see it, but we know it must be there because of its gravitational effect). Dark matter candidates can either be baryonic (which in astronomy means all objects made of ‘normal’ atomic matter), or non-baryonic, or a mix of the two. Non-baryonic dark matter is usually subdivided into two categories – hot dark matter (HDM) and cold dark matter (CDM). HDM requires particles with near-zero mass (like neutrinos) to travel very close to the speed of light (i.e. relativistic particles) to make up the missing mass in the Universe, while CDM requires more massive particles that travel at sub-relativistic speeds. Many astronomers believe that the missing matter in the Universe is likely in the form of some sub-atomic particle that we have not yet detected (but which particle accelerators like the Large Hadron Collider hope to find), which requires an extension to the standard model of particle physics. Weakly Interactive Massive Particles (WIMPs) – a class CDM particles – are one of the leading candidates for dark matter. WIMPs interact via gravity and the weak force, and do not interact with electromagnetism (so they don’t absorb or emit light and hence they cannot be seen) and they don’t interact with strongly with other particles or atomic nuclei. However, when WIMPs interact with each other they can annihilate and produce gamma rays. Using this knowledge, Markus Ackermann and collaborators used the Large Area Telescope (LAT) on board NASA’s Fermi Gamma-ray Space Telescope to search for gamma rays resulting from WIMP annihilation coming from dwarf satellite galaxies around the Milky Way. 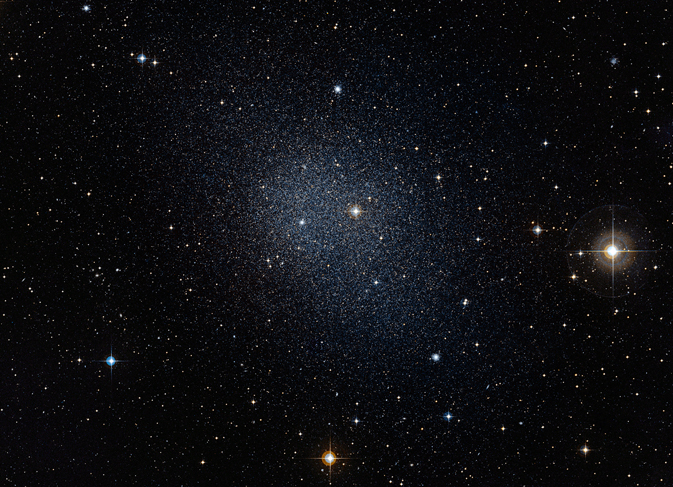 Dwarf spheroidal galaxies are ideal for this type of study because they contain large amounts of dark matter, little gas and very low star formation, and no gamma-ray emitting stellar remnants like pulsars and supernova remnants. The Cassini spacecraft was launched in 1997 with the aim of studying the Saturn system. The satellite arrived at Saturn on 1 July 2004 and conducted a range of experiments to determine the temperature, mass, structure and chemical composition of Saturn, its rings and moons using ultraviolet, optical and near-infrared remote-sensing instruments. The initial 4-year mission ended in June 2008, which was followed by a 2-year extended mission called the Cassini Equinox Mission. Cassini is now in its second extended mission called the Cassini Solstice Mission. 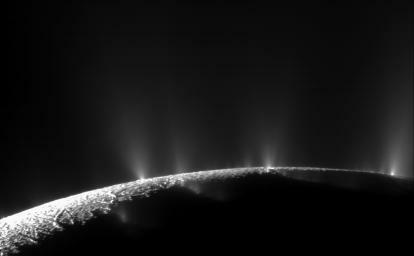 Astronomers were amazed in 2005 during a Cassini flyby of Enceladus when cryovolcanoes, which are icy water jets resembling geysers on Earth, were detected in the southern polar region of the satellite emerging from long surface fissures known as “tiger stripes”. Subsequent observations also detected complex organic compounds in the spray, which is very exciting from an astrobiological perspective. Tidal heating from Saturn keeps Enceladus relatively warm and “hotspots” have been found in the tiger stripes at the locations of the cryovolcanoes. Terry Hurford and collaborators suggested that the gravitational interaction of Enceladus with Saturn produces tidal deformations (like the tides produced on Earth by the Moon), which cause stresses and hence deformations of the surface of Enceladus resulting in the tiger stripes fissures. Hurford et al. have now been able to correlate the tidal stresses with the icy jet activity and show that the greatest stresses act on the tiger stripes near apocentre of Enceladus’s eccentric orbit around Saturn. WISE (Wide-field Infrared Survey Explorer) is a NASA satellite carrying a 40-cm telescope with an infrared camera. The satellite was launched in December 2009 and was decommissioned in February 2011. The WISE survey ran for 6 months from 14 January 2010 until 17 July 2010. The satellite was on a polar orbit, sweeping out a circle in the sky. As the Earth orbited around the Sun, after 6 months WISE was able to observe the entire sky. WISE took a picture every 11 seconds, resulting in nearly 1.5 million images. Each image covered an area of the sky about three times larger than the full Moon. WISE operated at four wavelengths: 3.4, 4.6, 12 and 22 microns. Data taken by WISE was downloaded by radio transmission four times a day to computers on the ground which combined the images. WISE has produced an atlas of more than 18,000 images covering the entire celestial sphere, and a catalogue of more than 560 million individual objects. 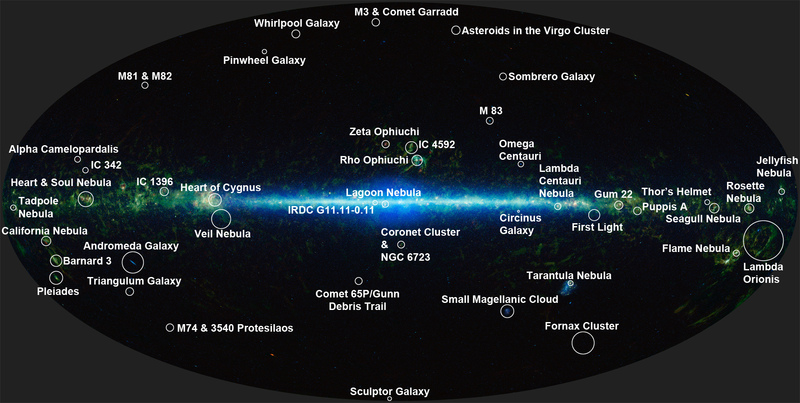 This week on March 14, the WISE team released an interactive all-sky mosaic along with the WISE All-Sky Data Release. Most of the objects in WISE are stars and galaxies, many of which have never been seen before. WISE has brought us a series of new discoveries including the coolest class of stars (Y-dwarfs); the first known “Earth Trojan” asteroid to share the same orbital path around the Sun as Earth; and a surprising view of an infrared light echo surrounding a supernova. More than 100 published papers to date have resulted from WISE and more discoveries are expected now that access to the entire catalogue is public. One of the “big questions” in modern astronomy is how do galaxies form and evolve and how is galaxy evolution effected by environment? Observationally we know that young galaxies contain a lot of gas and hence are efficient at forming stars. The light from these young galaxies is dominated by short-lived giant O and B type stars and hence the galaxies are blue. As galaxies age, they uses up their supply of gas and star formation is exhausted. The O and B stars are extinguished and the galaxy becomes “red and dead”. When we look at high redshift galaxies, this is what we find – galaxies are generally blue. But not all galaxies are not found in isolation. They are found in larger gravitationally-bound groups and clusters. In the local Universe, galaxy clusters typically comprise a few hundred to a few thousand galaxies. If we look at high redshift clusters beyond about z~1.5, we find rather diffuse proto-clusters containing young blue star-forming galaxies. Swinburne astronomers Lee Spitler, Karl Glazebrook, Greg Poole and Glenn Kacprzak are part of the international FourStar Galaxy Evolution Survey (Z-FOURGE) team who this week have announced the most distant discovered dense galaxy cluster which might contain the “missing link” between cluster that contain young blue galaxies and old “red and dead” galaxies. The cluster contains about 30 galaxies at a redshift of z=2.2, or about 10.5 billion light years away, in the Hubble Space Telescope’s COSMOS field. While finding the most distant galaxy cluster is pretty exciting, even more amazing is to find it in such a well studied region as the COSMOS field. The COSMOS field has been observed for thousands of hours by astronomers, but the new cluster was not visible at optical wavelengths. Using the FourStar infrared camera on the Magellan 6.5-m telescope in Chile, the team have applied a new observational technique whereby they conduct deep, near-infrared imaging with a set of medium bandwidth filters (compared to traditional broadband filters) between 1 and 1.8 μm. This allows them to trace the old stellar populations in galaxies within the redshift range of z = 1.5-3.5 via the Balmer/4000Å break (as the 4000Å lines gets redshifted to about 1 μm). The Balmer break at 4000Å results from absorption by metal lines in the atmospheres of old stars. Are Earth-like planets really like Earth? To date there are 760 confirmed extrasolar planets. While massive planets (about a Jupiter mass or more) close to their host star (within a few AU of the star) still dominate the population of confirmed extrasolar planets, over the past few years astronomers have been discovering “super Earth” (planets with masses between one and ten Earths) and recently some planets with masses less than that of our Earth have been discovered. But are these planets with a mass close to the Earth in any way “Earth-like”? In our Solar System we have three main groups of planets: the rocky terrestrial planets (Mercury, Venus, Earth and Mars), the gas giants (Jupiter and Saturn), and the ice giants (Uranus and Neptune). 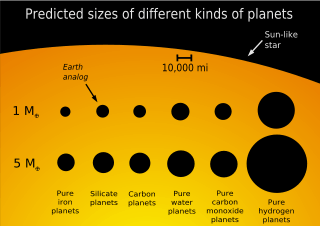 If we know the mass and size of a planet, we can determine its bulk density which can help us determine what type of planet we’re dealing with. The bulk density of the Earth is 5.5 g/cm3, while the bulk density of Jupiter is 1.3 g/cm3. When we say “Earth-like” most people think of a planet with a rocky planet with a similar mass and size to the Earth. So knowing the size of the newly discovered Earth-like planets can tell us of their bulk compositions – whether they are made of rock or ice or gas. And if they’re made of rock, are they mainly silicate like the Earth or are they something else all together – iron planets maybe, or carbon planets? The main goal of NASA’s Kepler mission is to search for habitable planets, or more specifically to estimate the number of Earth-sized planets in habitable zones of their stars in our Galaxy. The transit technique used by Kepler determines the size of the planet, and Kepler’s great sensitivity allows astronomers to find smaller planets. In December 2011, the Kepler team make two very exciting announcements: the discovery of two Earth-sized planets Kepler-20e and Kepler-20f (but too close to their host star to be in the habitable zone), as well as the first planet in the habitable zone, Kepler 22-b (but its mass, nad hence density, are not yet known). Of the 2,326 Kepler planet candidates, 37% are Earth and super-Earth sized. But are they Earth-like? In a paper published this week in Astrophysical Journal Letters, Jade Carter-Bond and collaborators demonstrate that whether or not an Earth-sized and Earth-mass planet is really “Earth-like” (meaning a rocky planet of about the same size and mass as the Earth and having a similar composition) depends on the composition of the nebular gas out of which it formed. And more specifically, it depends critically on the ratio of carbon to oxygen (which controls how much water there is and how much carbon the planets can be made from) and the magnesium to silicon ratio (which controls the amount and type of silicates available for the planets, which will effect plate tectonics and volcanism in the rocky planets, which in term effect atmospheric compositions). It may well turn out that there are many flavours of rocky planets in our Galaxy and that “Earth-like” is just one of many possibilities.